This homemade Christmas centerpiece of pine cones and greenery is easy to make, looks lovely, and you can choose your favorite spices to add the scent. First you’ll need to scent your pine cones. With a cotton swab or paint brush, dab glue on the inside edges of the pine cones. While the glue is still wet, sprinkle spices Cinnamon, cloves and nutmeg are my favourites) over glue, shake off excess spice and allow to dry completely. You can use fresh or artificial greenery. I used fresh pine (little sprigs can be taken from your Christmas tree for this project. Not many pieces are required to complete this). I filled the bottom of my basket with pine cones (if you don’t have enough pinecones, you can line your basket with paper or something similar). Fill your basket about half full with you liner material (pine cones). Insert small branches of pine around the outside edge and then fill the basket with pine cones until it is completely full. Insert small sprigs of pine throughout the pine cones, filling any holes that are visible. To add a little extra highlight, insert small and large berry sprigs (I used artificial berries) randomly whereever there is greenery. Tie a bow around the handles of your basket or if your basket has no handles, wire a bow to the sides of your basket. 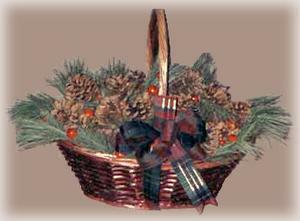 The pine cones can be decorated with ribbon and hung on your tree or arranged on a tray of candles.